On the 13th of February, 2017 the Red Hot Chili Peppers, including Anthony Kiedis, Flea, Chad Smith, and Josh Klinghoffer, performed at the Wells Fargo Center in Philadelphia, Pennsylvania, leaving the crowd screaming for more. The arena was jam packed, every ticket had been sold, and, although seats were provided, most people jumped up from their seats to dance when the Chili Peppers appeared. Many fans of the Red Hot Chili Peppers were able to come together for this event where they could just jam out together to their favorite band. Everyone seemed so excited to be there and could not help but yelling out with high spirits. Even in the back of the stadium, fans appeared to be content to be there listening and dancing to the Chili Peppers’ music. The new kinetic lighting system captured the interest of many eyes at the concert. Hundreds of cylinder-shaped lights descended from the ceiling above the stage and part of the audience creating shapes and waves that moved with the music. This was the first time that this technology was used, and it was very stunning and surprising to the public. The lights were an added bonus to the show for the fans who were already marveling at the music while enjoying spending time with other fans. People seemed to be feeling so much pure happiness as they were watching the performance of Chili Peppers with the amazing lights moving with their music. It filled each and every person with joy to be there in the moment and nothing seemed to matter anymore. This feeling is so perfect that no one would rather be anywhere else than watching this talented group put their love and all their strength into the music. The people attending the concert were screaming, clapping, singing, dancing, and just loving every moment. These people tried to grasp onto each second to try to make it last for an eternity, since people simply felt so great. At the end of the concert Flea made such a commendable, perfect statement by proclaiming, “I love that you came out tonight. I love everyone… Smile at people when you pass them on the street. Go forth and love each other.” He feels so thankful that people want to listen to his music and that he can jam out with his friends, and he is putting people in a great mindset to just be nice. While coming out for the encore, Flea appears moving back onto the stage doing a handstand to “walk” back onto the stage, for about 20 feet. 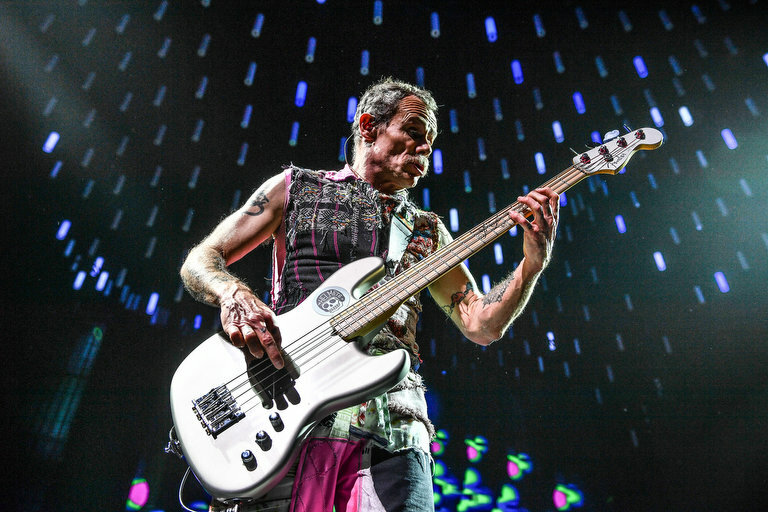 Flea didn’t have to do this obviously, but he loves what he does and just loves living while performing with friends. He seems to feel so fortunate to be whom he is and he has so much gratitude towards everyone. Flea even comes on stage to introduce one of the openers, Jack Irons, the original drummer of the Red Hot Chili Peppers. He makes a statement in regards to the Chili Peppers and Jack Irons in saying, “This day is our band’s thirty-second anniversary. I have known this cool guy since sixth grade…” Jack Irons performed with such skill and created amazing music with the drums as well as some interesting techno-like sounds in the background. The other opening band was Trombone Shorty, in which there were saxophones, a guitarist, drums, and “Trombone Shorty” himself played trombone, trumpet, and sang, which brought a variety of sounds together creating breathtaking music. The Red Hot Chili Peppers provided everyone in the audience with an overall unforgettable, undeniably incredible night. Not only did they show-off their magnificent musical madness, but they gave people great words to live by. The words and the music of the Chili Peppers may spread further out following the night of February 13th, 2017, if people take their strong words into action. Every person had to have left that concert more than satisfied with the remarkable events that occurred, and although they seemed to go by in a heartbeat, they positively changed that entire audience consisting of over 19,000 people.